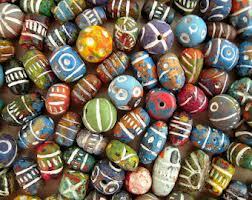 Ceramic beads are made from a mixture of clay and other chemicals, and then decorated. There are different qualities of clay and mixing chemicals which lead to varying degrees of hardness, texture and color of the fired product. There are different types of slips and glazes used to fire in a color or color effect. 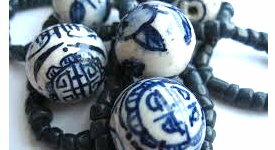 Sometimes the fired beads are simply hand-painted. Othertimes, they have a decal that is glased onto the surface. 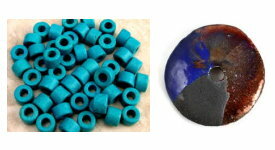 The nature of the manufacturing and artistic detailing of ceramic beads means that there will be some variation from bead to bead in size, shape and effects. If you want perfection, ceramic beads are not for you. 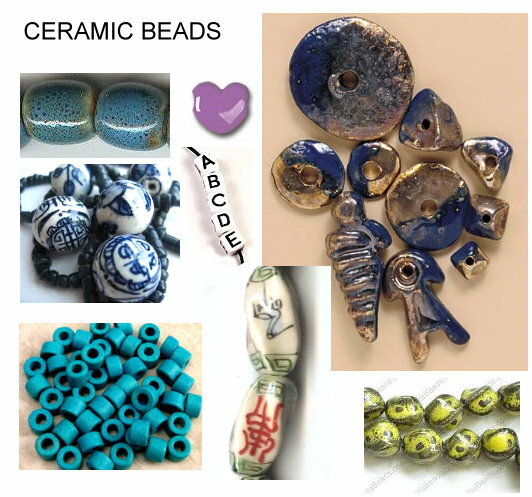 This category includes several types of ceramic beads, including porcelain beads from China ; large hole ceramic beads, such as the Greek ceramic beads, useful for stringing on leather and other thick cords, and clay beads from India . 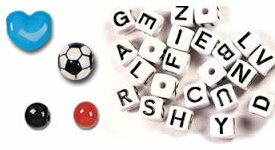 We will also have ceramic letter and symbol beads.